In Ravi and Roshan’s case, hunger was the only issue before their parents, who would toil from dawn to dusk to earn a paltry sum of Rs 300 a day. LUCKNOW: Ravi Shankar, 29, and Roshan Lal, 30, belong to different families but share identical stories. Both spent their childhood in abject poverty. Their parents worked as bonded labourers, often unable to feed all members of their families. That was, however, not unusual for the Kol community, to which the duo belonged. Kol tribals historically inhabit the backward regions of Koraon and Meja in Uttar Pradesh’s Allahabad district. But poverty has pushed many Kols to the badlands of Chitrakoot to turn dacoits. Despite living under such trying circumstances, Ravi and Roshan dared to dream big. They aspired not only to a life in which their families would be free of hunger, but also to do something for their community. It was not easy, but the two held on to their goal, finally graduating as lawyers. “My father knew my passion for education, and despite all hardships, sent me to school,” says Ravi, a native of Dhoos village of Koraon. His mother, an asthma patient, worked in a quarry near the village. “There was no money for her treatment. Often, we went to bed hungry,” he recalls. Somehow he completed his primary education and got admission at a secondary school. After finishing school, Ravi went to Nehru Gram Bharti University, Allahabad, with the help of Prof Sunit Singh of GB Pant Social Science Institute, whom he met at a local NGO. 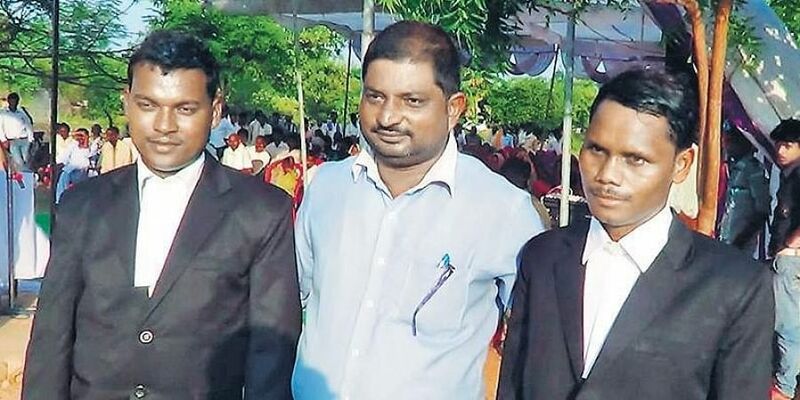 Now a proud lawyer, Ravi practises at Koraon tehsil. Roshan, Ravi’s batch mate, is from Bisari village in Meja. His parents used to work as labourers in the fields of rich farmers. His school was 15 km away and he had to walk all the way, every day. “I had seen enough hunger and poverty. My father had nine mouths to feed,” says Roshan, adding his siblings were not as lucky as him as they were not sent to school. “Destiny goes hand-in-hand with determination. The two youngsters are an inspiration and their efforts will go a long way in uplifting their community,” says Prof Sunit Singh.